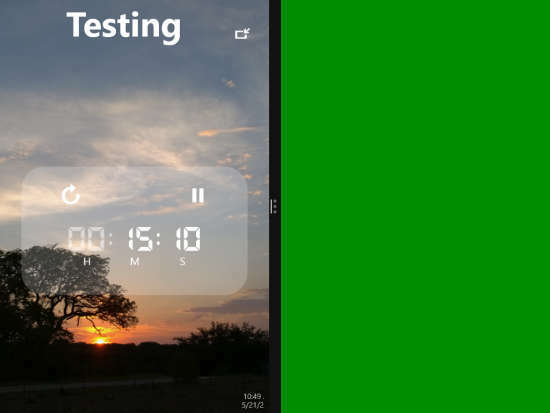 Cool Times is a free Windows 8 alarm clock app with three different tools: alarm, timer, and stopwatch. The app lets you set as many alarms as you want and it will alert you with a toast notification and sound. You can even snooze, and dismiss alarms directly from the toast notification. You don’t need to open the app to turn off the alarm. This makes this alarm clock app extremely easy to use. 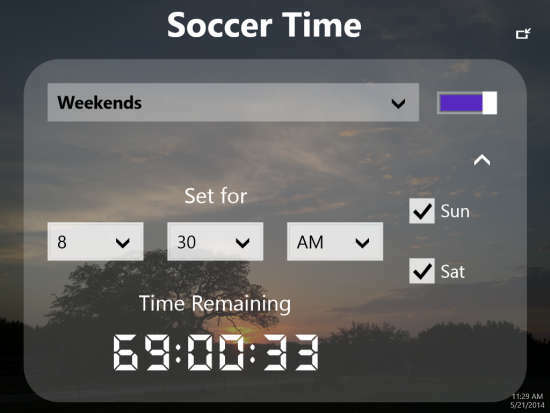 The additional tools of this app are Timer and Stopwatch. Timer also alerts you with a toast notification and sound. You can restart and dismiss the timer directly through the notification. Use the stopwatch to keep up with your activities and track how much time you are taking to complete a particular work. You can even share this with your friends directly through the app. The app also lets you customize the background using provided images or solid colors. Provides three different tools: Alarm, Timer, and Stopwatch. Alerts you with toast notification and sound. Option to customize app with available background images and solid colors. Ability to snooze, dismiss, or restart timer and alarm directly through the app. The app works well in snapped view mode. You can get Cool Times app free from Windows store using the link given at the end of this review. After launching the app, you will find different tools: Alarm, Timer, and Stopwatch. Setting alarm through this app is quite easy. On the left side you will find option to set alarm. Click on the default alarm name to change its name and customize the time and re-occurrences of alarm as per your preference. You can also track the time remaining for alarm through the app. You can use the timer to track your activities. It works well in snapped view mode and hence you can even use it to split your tasks by setting the time interval as per your choice. You will get toast notification with sound when the timer stops. Restart or dismiss the timer directly through the toast notification. To set the Timer, click on timer clock tile. Click on default name of the timer to set name as per your choice. Choose time interval for the timer as per your preference. Stopwatch can be used for many purposes. You can track your speed, work accomplishing time and many other things through this stopwatch. It also lets you set the name of the event for which you are using the stopwatch. To use stopwatch, simply click on the stopwatch tile and then on play to start it. Click on the provided dot icon to change event name. It also works well is snapped view mode. Right click on the home screen to get different options on the bottom of the screen: Background, Color, Share, Setting, and Search. To set the background of the app, click on background and then choose one image from provided options. 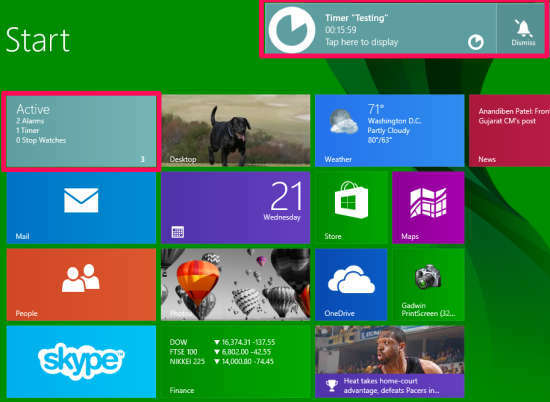 To change the highlight color, click on color and choose one color from provided solid colors to highlight tiles. 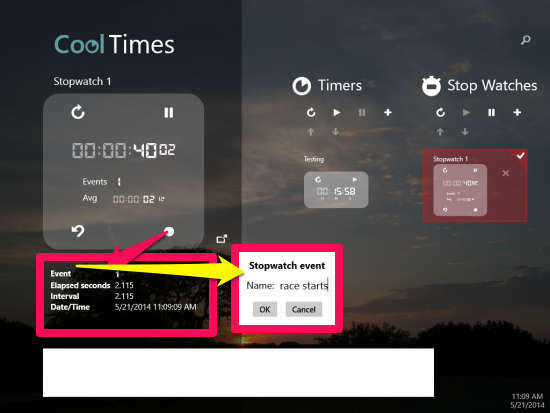 You can even share your time interval or stopwatch with your friends or family using the app. 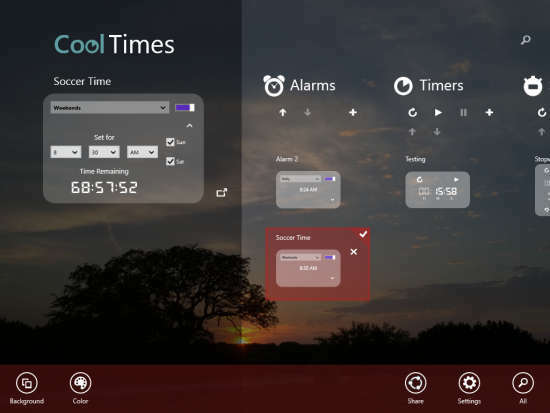 Cool Times is a decent alarm clock app for Windows 8. 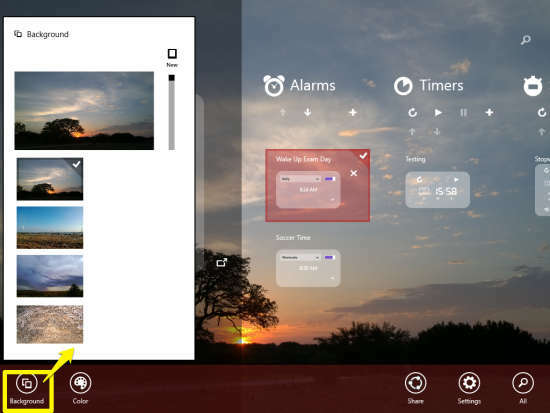 .Unlike other similar apps, this Windows 8 alarm clock offers multiple useful tools to track time. I found this app to be quite useful. If you are looking for an alarm clock app with a difference, then you should give Cool Times a try. Get Cool Times app here.